Located in beautiful downtown Rescue (Isle of Wight) VA, on Jones Creek. We are near historic downtown Smithfield, Virginia. just 5 miles from the James River Bridge. from Rt. 17 head down Smith's Neck Rd towards Rescue. Relaxed dinning on the water. 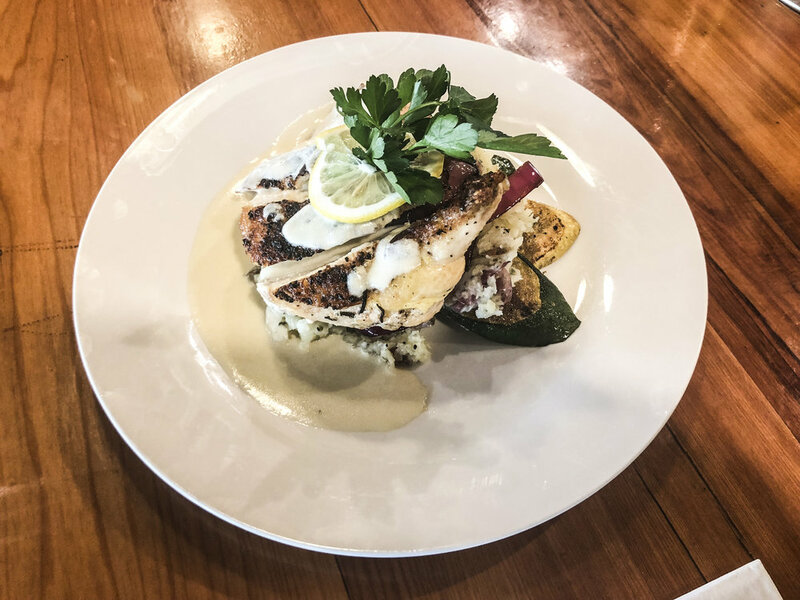 your local, family owned, seafood establishment welcomes you for some of our famous fried or sauteed entrees, stop by for a drink and a dessert, Enjoy deck seating right on the river, or join us inside for one of our live music nights. We have placed the dessert list on this menu for a reason. We are known for large, generous portions of food and it would be wrong if we did not inform you about our wonderful homemade desserts we offer before you fill yourselves up. Please pick out your dessert now in the beginning and pace yourselves. We will be available with to-go boxes if you don't think you can save enough room. For the heartier appetite, these are larger portions, with your choice of two of our fresh sides and a pair of golden brown hush puppies. Your choice of any one of the items below for only $5.95. First drink and any one of the sides included. We have used a very complicated formula, so we think that all of these desserts are at least minus 5 points on the weight watcher scale. We could be wrong too. Made from real key lime juice fresh from the Florida Keys, a and tart taste that will make you come back again and again. Available with toasted coconut and whip cream. No better way to finish off a great seafood dinner. These change with the season but they are home baked just like grandmas. Crispy brown crust filled with wonderful fruit cobbler, then topped with vanilla ice cream and a heapin of whipped cream. Warm fuzzy yum. Everytime the crew builds one of these, they try to outdo the last. For the chocoholic and serious sundae person only please. Chocolate fudge brownie, two scoops of vanilla ice cream, hopped pecans, rich chocolate sauce, heap of whipped cream, topped with cherries. Vanilla, however if you would like a little chocolate sauce, whipped cream and or a cherry. Just ask! All of these items come with kettle cooked potato chips. Sub the chips for any other side for $1.99. Served on a bed of french fries. For those who can't decided on just one, with your choice of two of our fresh sides and a pair of golden brown hush puppies. A 6oz filet or a 12oz New York Strip cooked over live charcoal and your choice of one surf, crabcake, scallops, or shrimp. $22.95 or upgrade to the 12oz Ribeye for $4.00. Romaine and iceberg lettuce, tomatoes, red onions, peppers, cucumber. With entree' $2.95 ala carte $4.95. Reservations are for parties of 6 or more and can be booked by calling us at 757-356-1005. Episode: "Where the Locals Go"